We designed and delivered a stylish monochrome washroom design at a central London office as part of a major refurbishment programme. 180 Great Portland Street, which is located in the heart of one of the West End’s most vibrant neighbourhoods, was originally built as a luxury mansion block before it was transformed into offices. The office accommodation, which is housed behind the building’s original imposing Edwardian façade with a contemporary open glass entrance on the ground floor, is spread over five floors and has recently been refurbished to provide Grade A standard open plan office space. 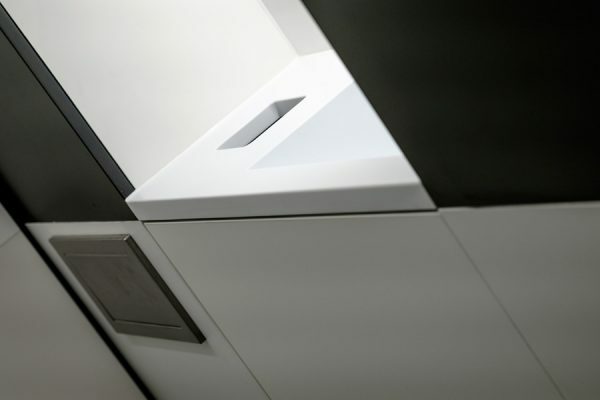 Opting for a so-called ‘superloo’ design, with self-contained cubicles including a WC, vanity unit and hand-drying facilities, is an ideal way to maximise the available floorplate on each floor. Such a design not only removes the need to make space for a separate vanity area, it also means that the washrooms can be unisex. 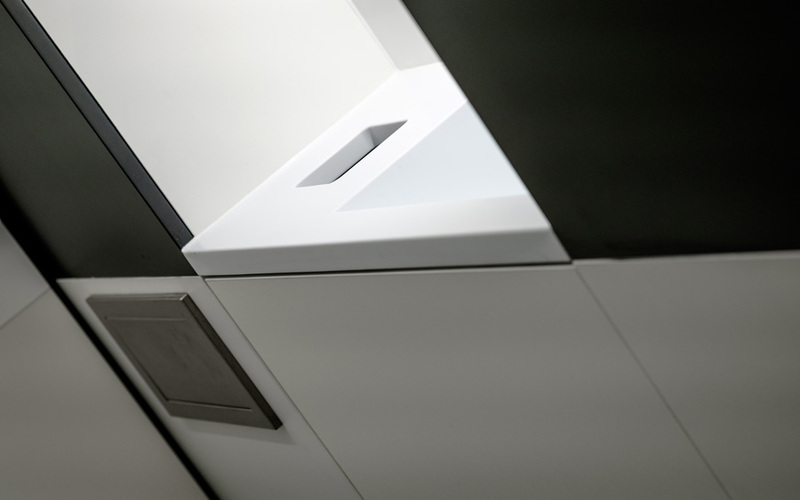 The cubicles were all specified using our Alto floor-to-ceiling flush fascia toilet cubicles in order to provide complete privacy for end users, while pivot hinges which allow the doors to open both inwards and outwards for safety, were installed. 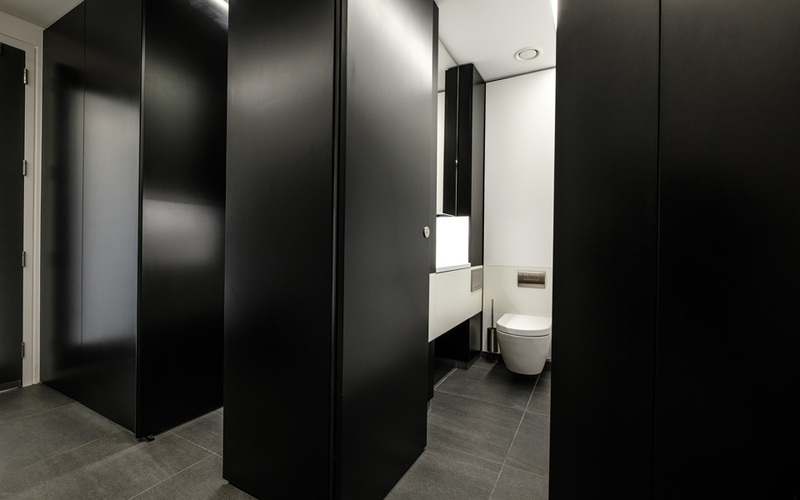 Manufactured from hard-wearing MDF, each cubicle was spray-painted to a high sheen finish in two colours; black for the exterior faces and pilasters, while white was used for the interior of each cubicle. The cubicles were all fitted with stainless steel ironmongery in a satin finish to contrast with the high sheen doors. 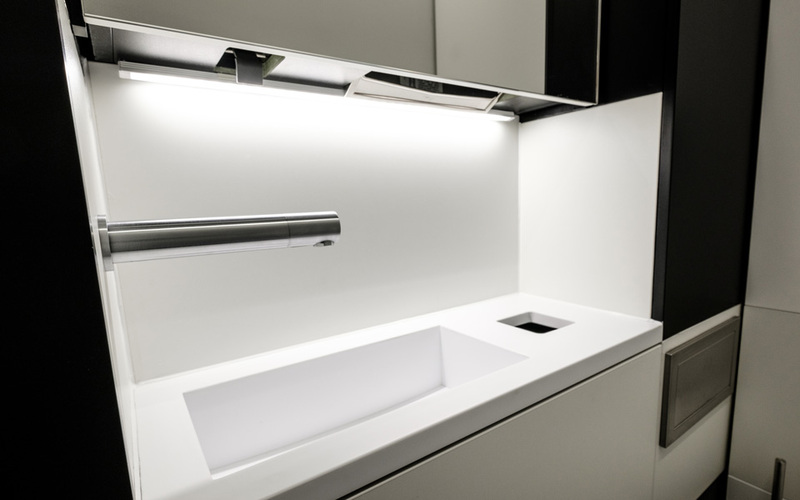 The individual and compact Corian vanity units, in a crisp white shade, were each manufactured with an inset waste bin with stainless steel wall-mounted taps. 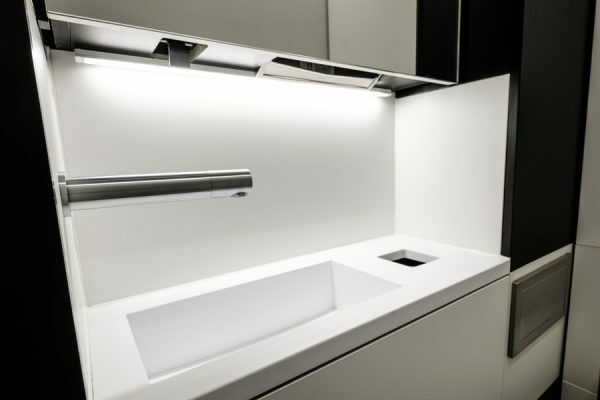 The white sinks and white under panels are complemented by black surround, adding to the clean contemporary design. We also fitted mirrors above the vanity unit, each complete with a concealed paper towel dispenser to ensure the cubicles remain clean and tidy. Completing the project, we also designed and installed a disabled facility using exactly the same colour, specification and finish to create an inclusive design.